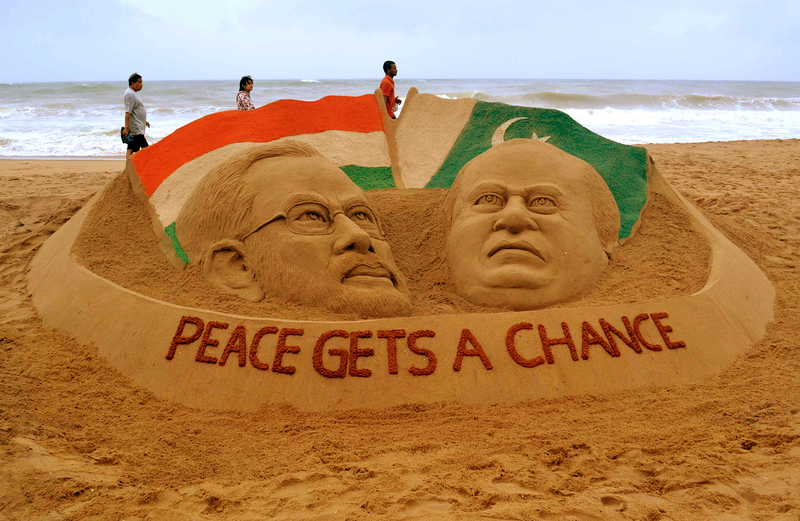 People stroll past a sand sculpture of Indian Prime Minister Narendra Modi (L) and Pakistan's Prime Minister Nawaz Sharif, created by Indian sand artist Sudarshan Patnaik on a beach in Puri, India. Full membership of the Shanghai Cooperation Organization (SCO) could bring a host of benefits for India and Pakistan, Topychkanov, South Asia expert and Associate in the Carnegie Moscow Center’s Nonproliferation Program told RBTH in an exclusive interview. “This organization can provide you a platform for bilateral dialogue and also to help you to understand, experience confidence building measures on borders,” Topychkanov said. He cited the example of agreements that China signed with Russia and Central Asian republics on the transparency of the deployment of conventional forces on borders. India and Pakistan are in the process of becoming full members of the SCO. The organization presently has Russia, China, Kazakhstan, Kyrgyzstan, Tajikistan and Uzbekistan as full members. While emphasizing the need for good relations between Moscow and Islamabad, Topychkanov said Russia did have genuine concerns about terrorism originating in Pakistan. “We need to have a fair conversation with this country about terrorism, about Pakistan’s policy in Afghanistan and many other issues,” he said. Topychkanov said there were cases of Russian citizens, even in the Moscow region, who could have participated in terrorist activities in Pakistan and Afghanistan. He added that Russia was aware that there were more than dozens of groups of Russian citizens who were involved in terrorist activities in the Af-Pak region. “This threat is growing,” he said, adding that these concerns would be raised in the bilateral dialogue with Pakistan. Moscow still needed a clear Pakistan policy, he said. He added that Russia had still not articulated its goals, when it comes to Pakistan. “We need to explain to India about what we really want from Pakistan,” Topychkanov said. Russian President Vladimir Putin will attend this year’s BRICS summit in Goa in October. Topychkanov shrugged off a suggestion that the informal grouping of Brazil, Russia, India, China and South Africa could form some sort of geopolitical alliance. Topychkanov said it could be “counter-productive” for the BRICS to become a political body. “The key goal of BRICS should be to establish a network of contacts between people and societies in the member countries, including with Brazil and South Africa.” He added that a simplified business and tourist visa regime was needed to take boost the intra-BRICS relationship. Vladimir Putin told reporters last year that Indian Prime Minister Narendra Modi was a “personal friend” of his. However, media reports speculate that the leaders, who many consider to have similar styles of governance, don’t have a personal chemistry. While insisting that the relationship between the Russian and Indian leaders is good, Topychkanov said their approaches to diplomacy were different, since Modi was a relative newcomer to the world of international affairs and Putin was a veteran. This could be why there isn’t a better personal chemistry between the leaders, Topychkanov said. Putin’s annual summit with Modi is likely to be held immediately after the BRICS gathering in Goa. Topychkanov does not place very high expectations from the visit but said he believed that there would most likely be agreements in traditional Indo-Russian niches like defense and nuclear energy.